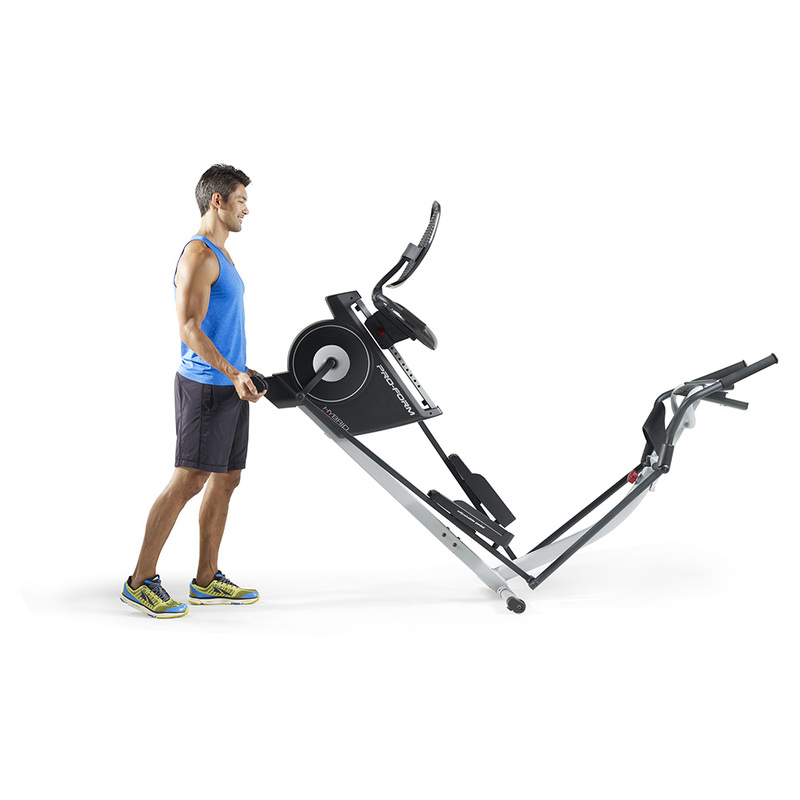 Train with versatility when you step up to the ProForm® Hybrid Trainer. The 16 digital resistance levels take you from beginner to advanced as you progressively get stronger. 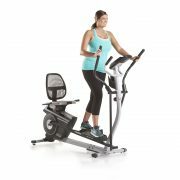 Now it’s easier than ever to choose your workout—from either a cardio recumbent bike or a total toning elliptical. Plug in your iPod® or MP3 player to make every workout more energetic with your favorite tunes. 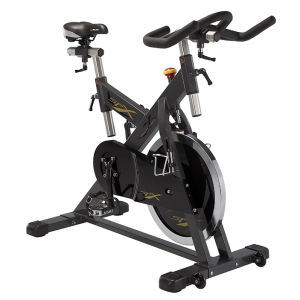 The Hybrid Trainer is double the functionality at an incredible price. Making time for world travel is a challenge—but it doesn’t have to be impossible. 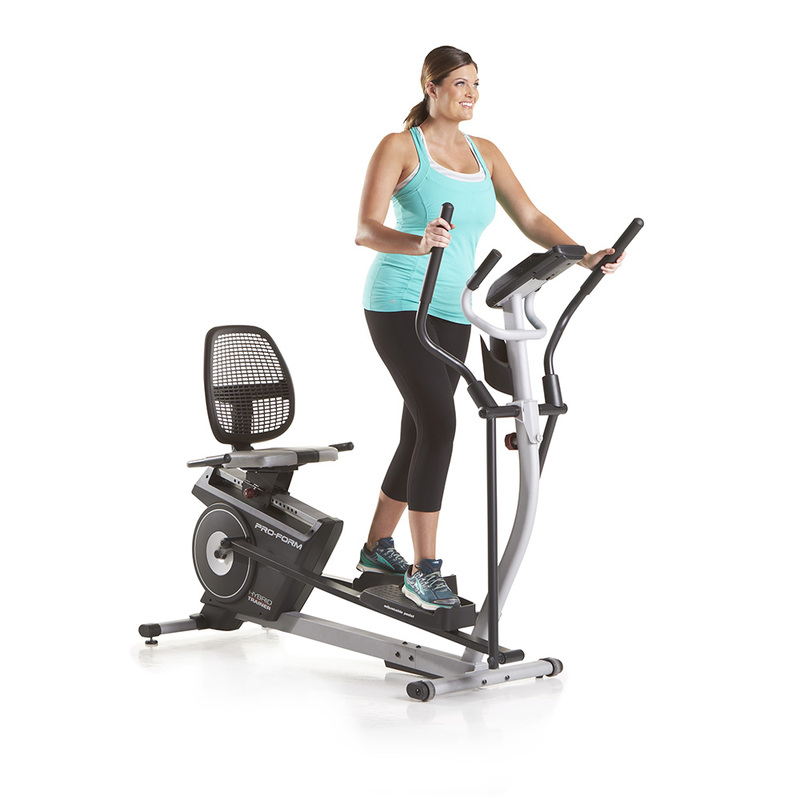 Visit Paris, hike the Swiss Alps, or jog the Chilean coast with your iFit® Coach Ready™ elliptical powered by Google Maps™. You can also customize your workouts with unlimited programs designed by certified personal trainers. And our ever-growing workout library offers programs that progress with you from first-time user to daily enthusiast. This smart fitness product comes in Smart mode. 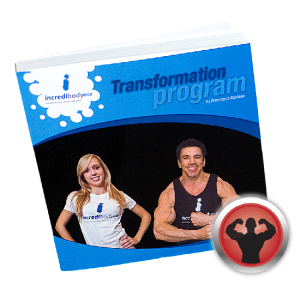 It comes with a 30-day, free membership to iFit Coach. With your membership, you’ll enjoy thousands of on-demand, virtual workouts, both in the studio and around the world. 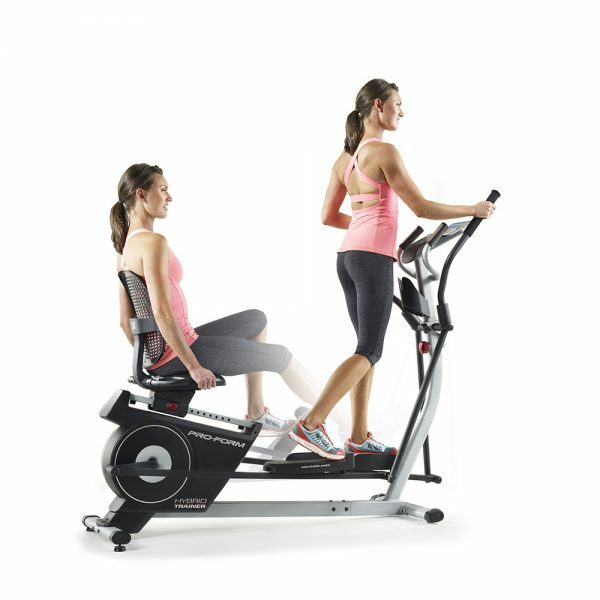 Led by world-renowned trainers, they’ll adjust your machines settings to personalize each workout. Access them by downloading the iFit Coach App and connecting your tablet or smartphone to your equipment. The console must be activated by registering and entering a credit card, free cancellation at any time. If you do not want a smart device, register your machine on line and then contact Icon customer support to disable the smart feature and enable your console for regular use. 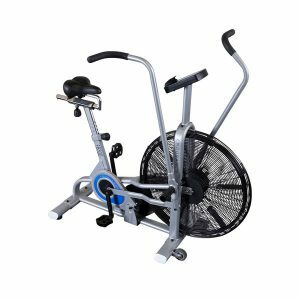 Delivering the benefits of an exercise bike and an elliptical, this trainer offers comfort, variety, and a low-impact cardio workout. 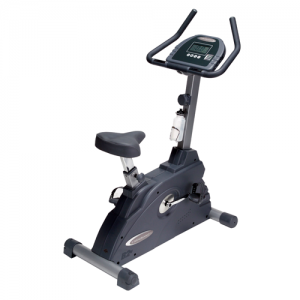 Adjust the pedals to accommodate an elliptical or bike position. 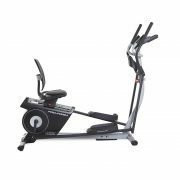 Plus, the console adjusts, so whether you’re sitting or standing, you can easily monitor your workout on the large LCD window. Take the guesswork out of your workout while making it fun and challenging! 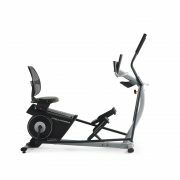 The Hybrid Trainer includes 16 workout programs designed by a certified personal trainer and automatically adjust the resistance of the machine. The simple navigation of the apps makes it quick and easy to select your workout and get moving. The built-in power meter displays your power readout on the screen so you know when to pick up the pace or slow it down. This display tracks your speed, time, distance, and calories burned so you can monitor your training stats. Watch your favorite stats on the Priority Display. 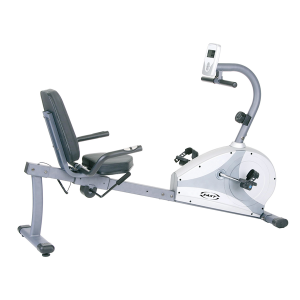 And the adjustable console angle means no matter your height, you’ll be able to view your workout info. With 16 digital resistance levels you can start out easy and progress to intense. Each level is smooth, frictionless, and silent with our patented SMR™ Silent Magnetic Resistance. Once you create your raving workout playlist, just plug your iPod®* or MP3 player into our built-in sound system. Built with two 2-inch speakers, you can turn up the tunes and turn up the tempo. Experts have learned that we actually increase or decrease our pace to match the tempo of our tunes. Plus, music has also been proven to lower perceived exertion. That’s great news. Enjoy long, full strides with this generous 15-inch stride length. We’ve learned that the best fitness experience is all about the details. With the Hybrid Trainer, you aren’t just working out, you’re enjoying a comfortable ride. Our oversized seat has added cushioning and easily adjusts so you find the perfect fit. 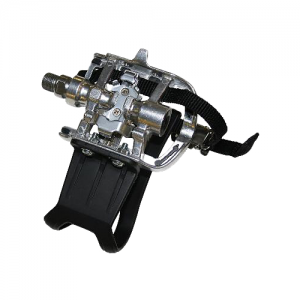 Feel secure when you step into our oversized pedals. 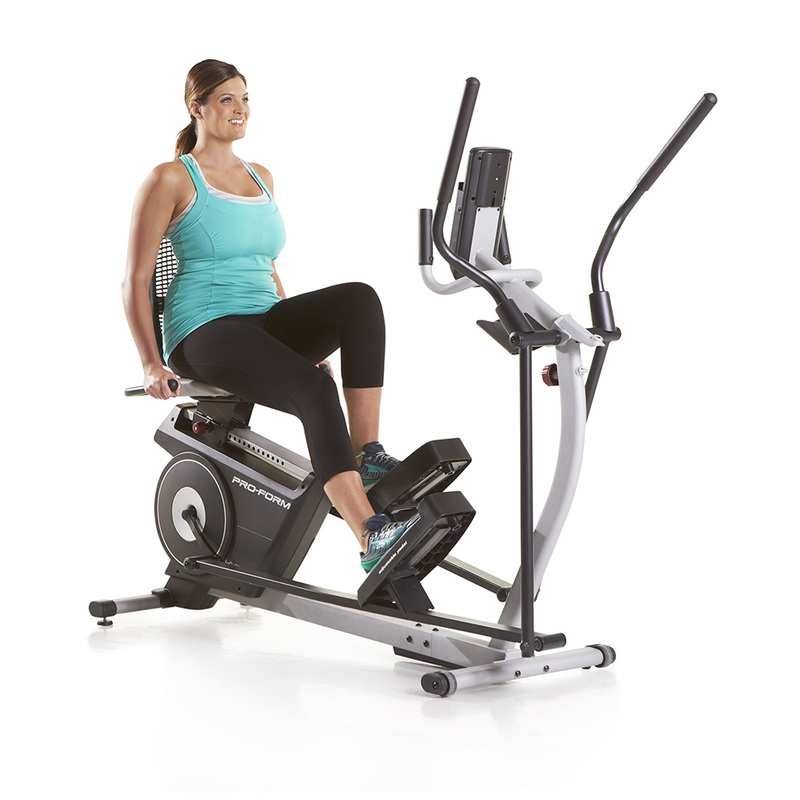 With several foot position options and better traction than ever before, you can settle in for a great workout. 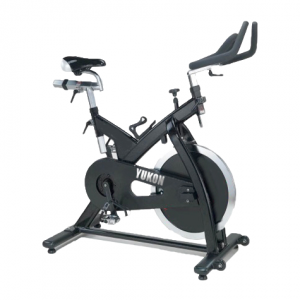 Experience a smooth, steady stride with the flywheel made to perform. Stay hydrated throughout your workout by keeping your water bottle close. 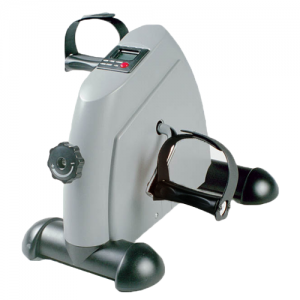 This convenient water bottle holder is built into the Hybrid Trainer frame for easy access. 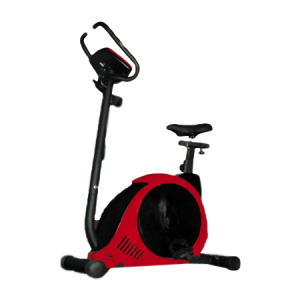 Moving this machine out of the way is fast and easy with the front-mounted wheels. Maximize your workout with the ultimate tool: heart rate training. A built-in, dual-grip monitor keeps you in your target zone. This Hybrid Trainer accommodates up to 350 pounds. 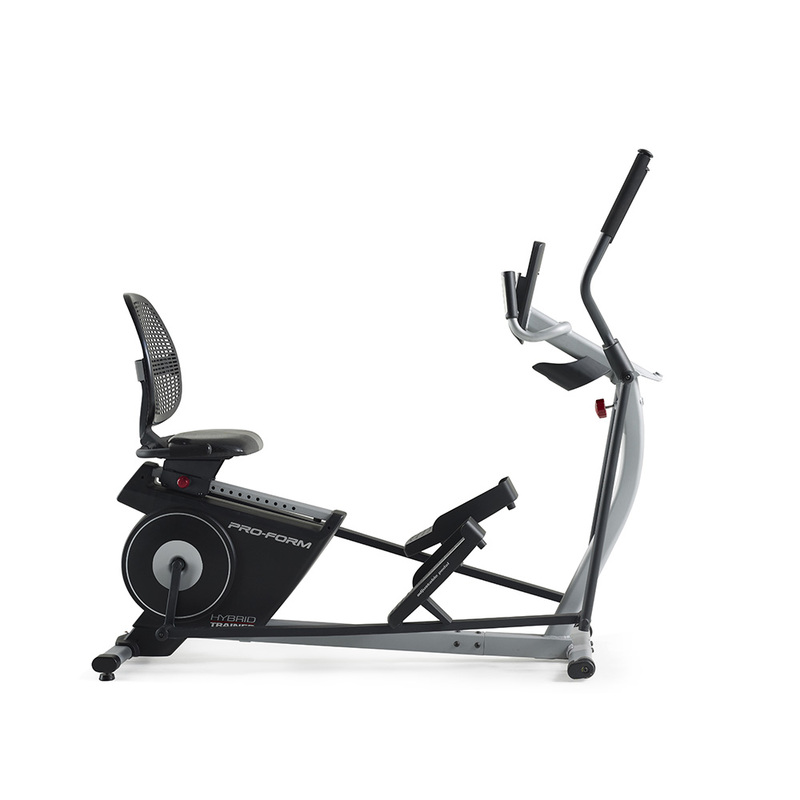 The ProForm® Hybrid Trainer is protected with a 5-Year Frame Warranty and 90-Day Parts & Labor Warranty.